Directions for the St. Paul Orthodox Church at GanSuk Dong, Namdong-Gu, Incheon. ---you take the Kyung-In Express Way to Incheon, and exit at the Incheon City Hall or Dong-Am Subway Station (동암역). From City Hall or Dong-Am St. drive toward Ju-Won Hill (주원고개) and the Ewha Park(이화공원), and then you can find the St. Paul Orthodox Church with a white metal Cross on the top of the Church building. Have a nice trip. In case of using navigation, you may input "성바울로성당". ---Take Kyung-In Line for Incheon and come until Dong-Am Station (동암역) and out to the No. 1 Exit (South Gate). Get on a town-bus No. 531 to Ju-Won Hill (주원고개) and get off after two bus stops, at Ju-Won Hill (주원고개) bus station. 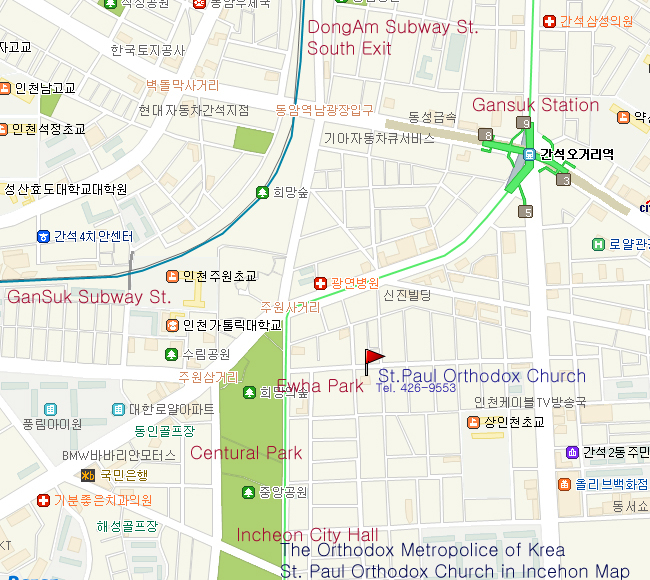 Then walk across at the traffic light to come to the Ewha Park(이화공원), and in front of the main gate of the Park, you see St. Paul Orthodox Church Building with a white metal Cross on the top of the Church building.